On my second day in Italy, before my workshop began, I caught a train from Florence to Livorno to visit a dear old friend. I've known Nicoletta for 20 years now! Wow. That's half of our lives. She recently had a baby, and I was eager to meet her little sweetie pie. We spent the whole day visiting and catching up (there was a lot of catching up to do!). It was so wonderful. After a lovely lunch outside in the garden made by Nicoletta's mom (pasta with red sauce, veggies, fresh bread, home grown plums for dessert - ahh...) - we headed into the city center for a stroll with her sweet Mom, and her sweet little babe. After a little roaming, we arrived (inevitably!) on the subject of Livorno's culinary specialty: "Cinque e Cinque." Literally, the translation is "five and five," and the origin of this treat is 5 Lire worth of bread and 5 Lire worth of "torta di ceci." (The lire was Italy's currency before the Euro, for you youngins). "Torta di ceci" is a thin, savory pancake/bread made with chickpea flour. In other areas of the Meditteranean, it is also known as "socca," "cecina," or "farinata." Nicoletta and her mum led me to this unassuming local spot called De Gagarin. You wouldn't know it from the outside, but this is THE PLACE to have cinque e cinque in Livorno. It's all they serve. Inside was jam-packed with people, all happily grooving out on their delicious food. Inside was so beautiful, but I chickened out and didn't take photos. It was tiny and rustic and the decor was as fancy as the exterior would suggest. But the emotional atmosphere was warm and inviting. 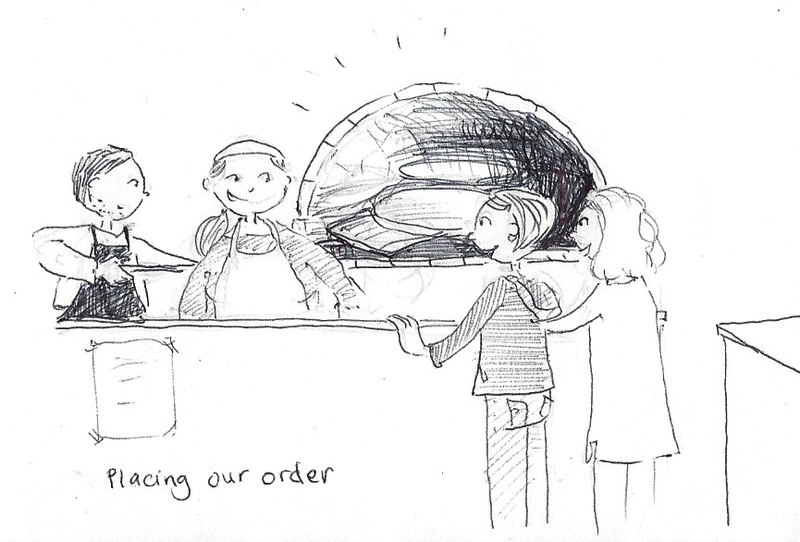 Working the counter was a portly, friendly and efficient gal - serving up orders. Behind her was just one other fella, working the oven. The oven was enormous - a wood burning pit at eye-level, and with at least 3, maybe 4, huge round copper pans of torta di ceci baking inside. The pans were at least two-feet across. The oven was glowing with heat and torta di ceci potential. I went in thinking I would just have the classic bread-and-torta, but then I saw two ladies seated near the door who had EGGPLANT with their order. Hello! I asked Nicoletta and her mom and they said this was part of the specialty! So, obviously, I decided right then and there to get my sandwich with the additional grilled eggplant. All of this together adds up to One Very Happy Amey. I was instructed by my pal that I had to get a drink with it: beer, iced tea, or a Coke. I chose a Coke. A rare treat! You'll see it poking out behind my bum in this pic. I know this sandwich doesn't really sound like the most amazing thing - but it really was. I think it's one of those cases of just a few ingredients, each made perfectly and with care, coming together to create much more than the sum of their parts. I was pretty much levitating with joy and flavor appreciation with each bite. All that, and - best of all - it was a totally authentic culinary travel experience that was 100% vegan. Such a rare and wonderful treat when that happens. We had such a sweet time. The little restaurant itself was already crowded beyond capacity, so we headed just across the street and sat on this little wall - each enjoying our treat, enjoying our time together, enjoying our new little baby friend in his stroller, enjoying the moment. p.s. I've done some searching around online, in Italian, and have found a few good recipe sources for the bread and the eggplant, as well as the torta di ceci. You can expect a complete recipe/tutorial sometime soon. I love having authentic vegan foodie experiences on my travels. It's the best feeling. I think that sandwich sounds amazing and you certainly look super happy! I've never had socca, but I've always been curious to try it. It looks like it'd be especially good in a sandwich with eggplant. YUM!! The sandwich sounds like perfection to me! It's only when I see things like this that I miss bread — good Italian bread. I've made socca a lot and I love it, but I never thought of putting it in a sandwich.